SO this is the project I alluded to earlier this week. I spotted magnetic spray paint from Krylon while shopping for glitter at Michael's. It was only $7 for the bottle, so I thought I'd buy it and do a little review. My boss gave me this frame (thanks, Genny!) several weeks ago and it has been hanging out, waiting for a conversion ever since. It's the perfect host for our Krylon review! All in all, it turned out alright. The strength of the magnet is dependent on how many coats you use. They suggest 2, I used 4 and still didn't find it to be as strong as I'd like. Also, when they say you need to shake the can for 2 full minutes before using, they're serious. I thought it only needed to be done for the first use.. boy was I wrong! If you don't shake it for 2 minutes every time, you end up with the mottled finish that I got. It started out even, then when I didn't shake properly for the second coat it ended up looking like this. And 2 more coats of evenly applied spray didn't help in the end. However, it's a fun, inexpensive little project and it was fun! 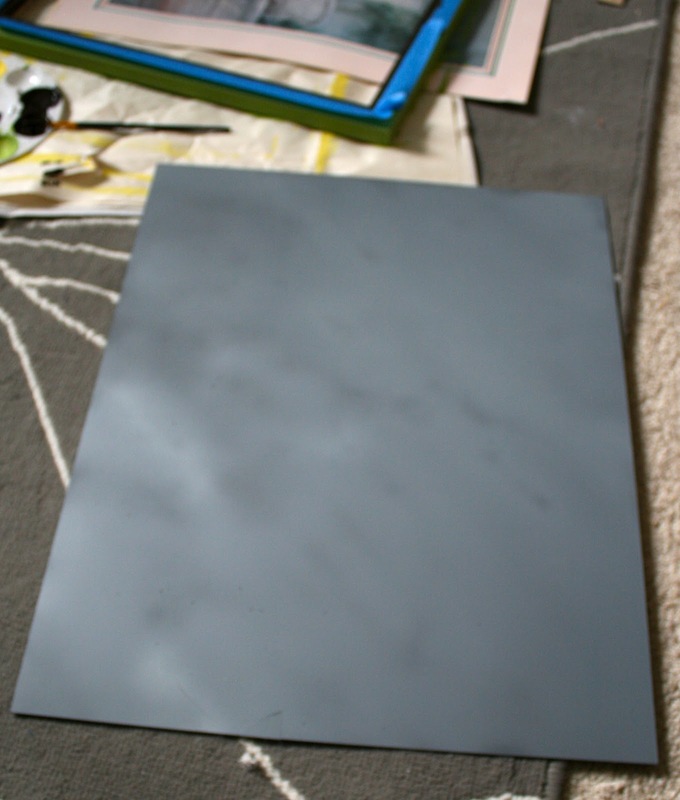 Also, you can paint over the spray, making a magnetic board in ANY COLOR you want! The room this went into is grey + dark black/brown with lime accents, so I just left the board in grey. 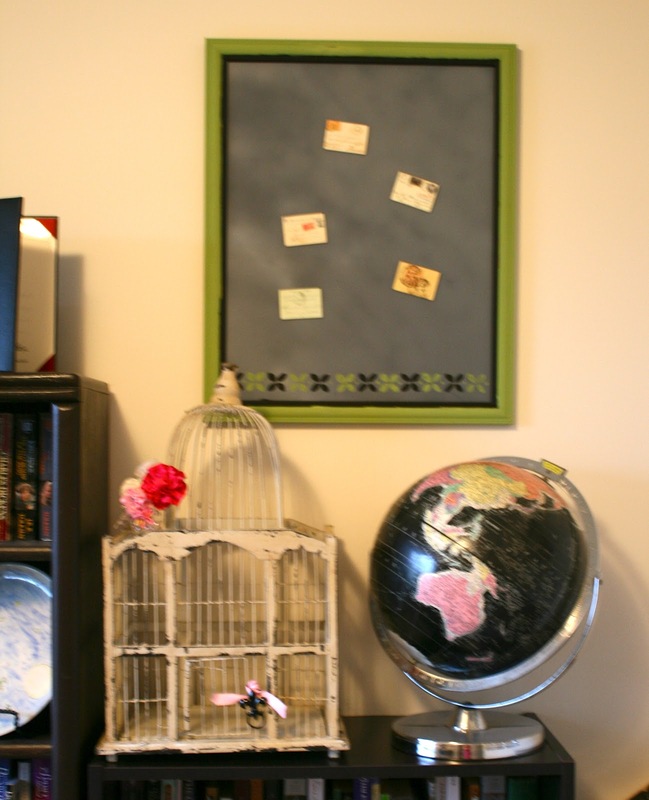 You could do a lot with this- a frame repurpose is the bare minimum, so I'll see what else I can come up with. If you have any good ideas- let me know! (1) Prep it. Sand down any glossy surfaces with 220 grit paper to give the spray something to adhere to. (2) Spray it. Spray your clean + dry surface in a sweeping motion. Be sure to shake the can for TWO FULL MINUTES before EVERY coat. I did four coats. I probably should have done another 2. Each coat dries within 30 minutes. I suggest doing the coats fairly close together. If you wait more than 4 hours between coats, you have to wait an excessive amount of time before you can start spraying again. (3) Paint it. I used a stencil to paint a little design on the bottom. The stencil stunk. Next time I'll use a contact paper stencil so that I get cleaner edges. I also painted the frame (4 coats acrylic paint) and then added painters tape to edge in some of the same dark brown/black color on the inside. (4) Hang it. Sorry for the blurry pictures! I started this project and finished it several hours later, and am now up wayyyyy later than I should be! I needed to get a ridiculous amount of work done because this will be my last post for the week. I'll explain next week, though I may not post again til Tuesday. That will probably be the longest I've ever gone between posts! I hope you have a fantastic weekend, and that your days are warm and sunny. As always, thanks for reading!